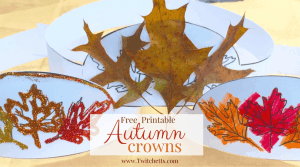 Create fun twig art with your kids with this easy nature craft for kids. 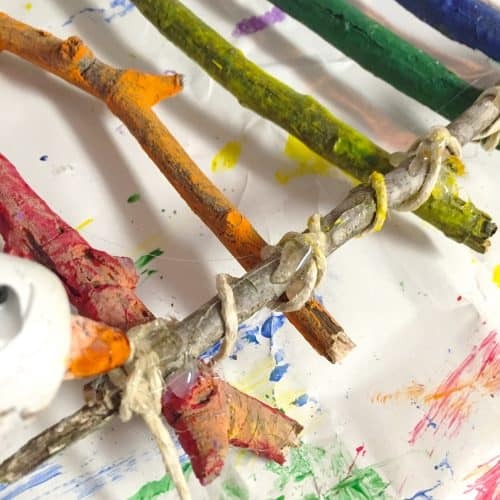 Gather some sticks and twigs and let’s get creating! This time of year we are outside every chance we get. It isn’t too hot yet, but too warm to stay cooped up inside. 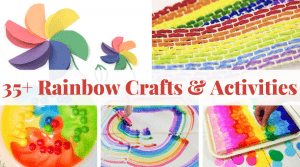 So how do we get crafty outside? 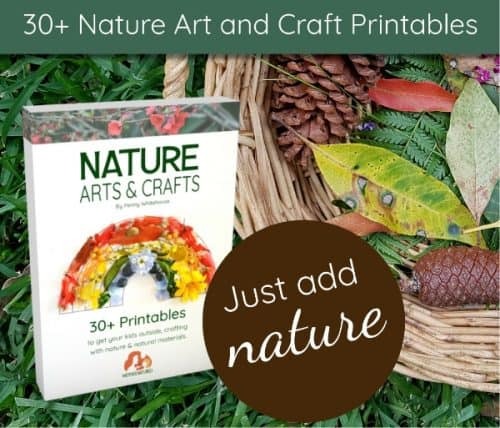 We create crafts for kids using nature. 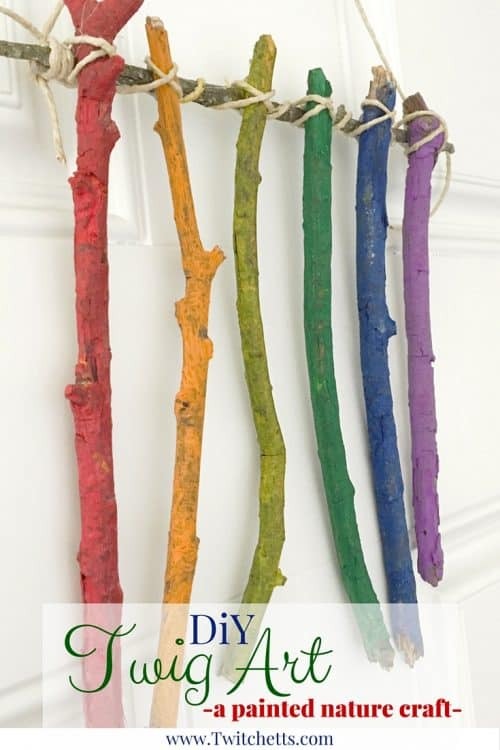 Like this DIY twig art project. Since our yard was full of sticks and twigs, I sent V out to collect some. Now we just need to make them beautiful. This is simple enough since V is obsessed with painting just about anything she can get her hands on. 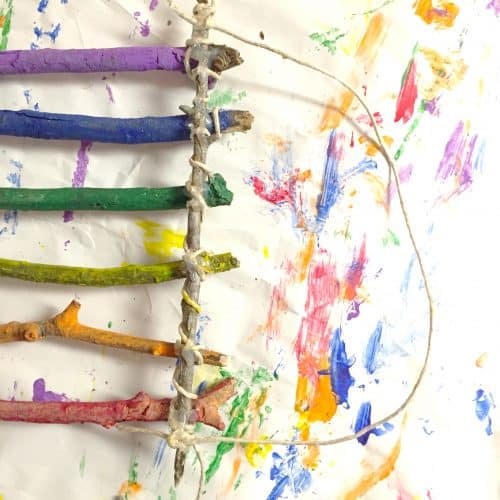 Painting is great for building fine motor skills so we incorporate it often! After we collected a pile of sticks and a bunch of paints, we got started. 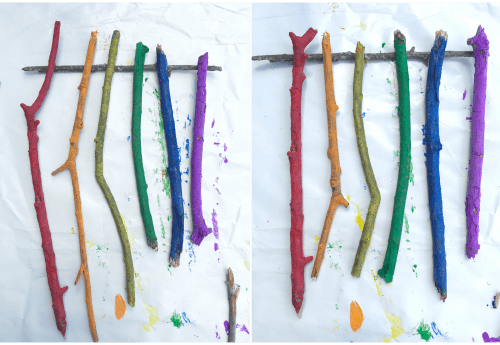 While these multi-colored sticks turned out great, it got me thinking… We could work together to create a great piece of art! Twigs. You need one more than the colors you will be painting. Pick ones that are about the same size. Paints. You could make yours any color pallet you want. I chose to do mine the colors of the rainbow. Some sort of string. I like to use hemp when working with natural mediums. 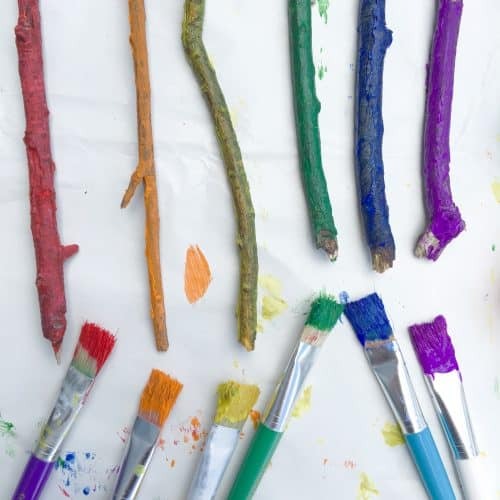 Start by painting your sticks. 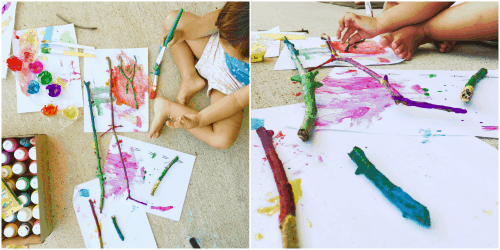 If you are letting your little one do the painting, give them one stick, one color of paint, and one paintbrush. Then swap out for the next color and the next color. 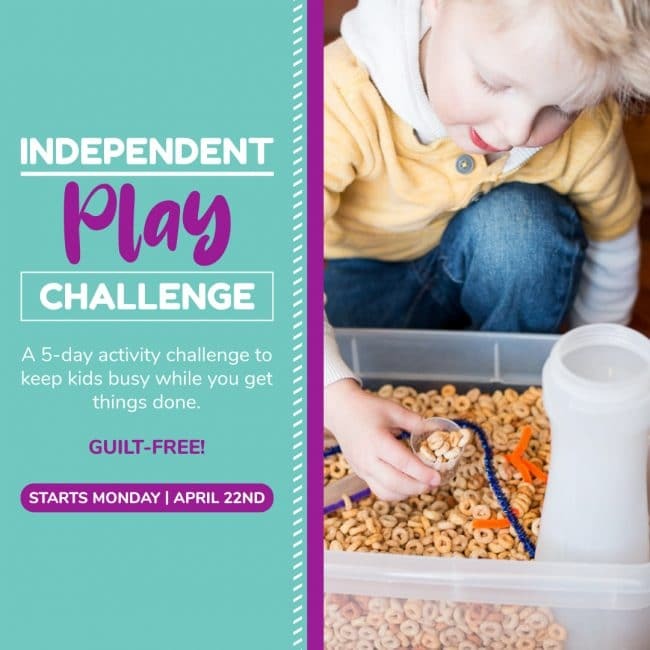 You can also take out some of the stress of painting with young kids checking out these tips. 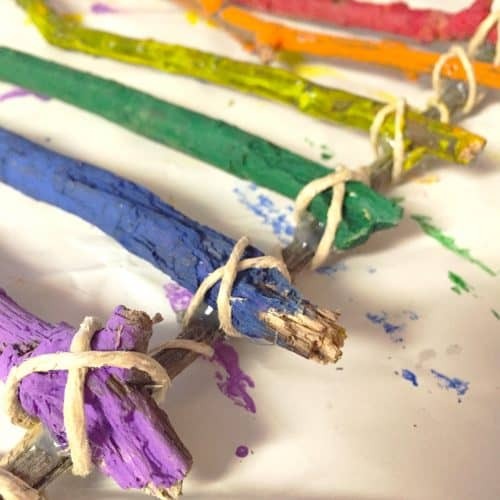 Once the sticks have dried lay them out on your last unpainted stick. You can break off any extra stick if you want to even them out. 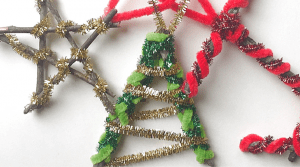 Use hot glue to hold them in place and then wrap them with your string. Flip over and add more hot glue on the back. 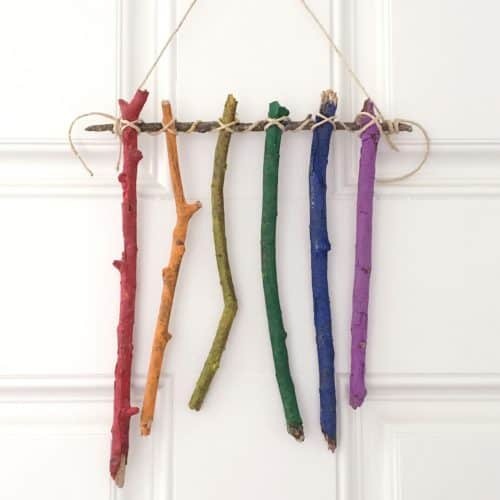 Then add a string to hang your DIY twig art from once it is dry! Now I can hang up this little piece of art that I made with my daughter. It is the perfect addition that brings some beautiful bright colors to the room. I love when a toddler craft becomes a keepsake. This will be something I will hold onto for awhile. 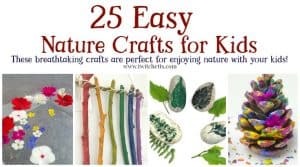 This isn’t the first fun thing we have made from twigs… Check out these fun nature ornaments that you could create any time of the year!